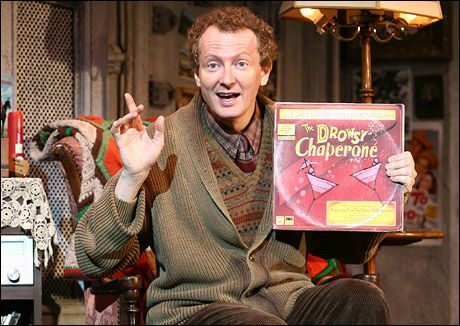 It was announced on Wednesday, February 13th, that Clay Aiken would be returning to the North Carolina Theatre for a week of performances in the Broadway Musical, The Drowsy Chaperone. Clay has been cast in the role of the Man in the Chair (narrator), the character that leads the entire story. The play will be performed at the Raleigh Memorial Auditorium from May 7th to May 12th. Although I am a huge fan of Broadway shows, I did not know much about this musical. I wanted to know more about what to expect to see on the stage. The music and lyrics of The Drowsy Chaperone were written by Lisa Lambert and Greg Morrison. The show opened on Broadway on May 1, 2006 and promptly won the Tony Award for the Best Book and The Best Music. The show also had major productions in Los Angeles, New York, London, Japan, and Toronto. The show also had two North American Tours. The audience is greeted by the narrator, Man in Chair, sitting on a darkened stage. He is a fan of vintage musicals who seems to be suffering from free-floating depression, and he quickly decides to cheer things up by playing a record of the original cast recording of a (fictional) Broadway musical entitled “The Drowsy Chaperone”. 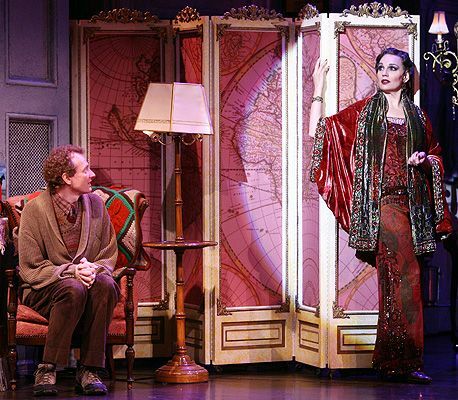 No sooner has the needle touched the record than we, together with the narrator, are transported to a 1928 Broadway theater and into “The Drowsy Chaperone”, a play-within-a-play crammed full of every cliché, gag and gimmick from the golden age of musicals. …the Man in Chair attempts to play the record of the Second Act of the show. However he mistakenly begins playing a song (“Message From a Nightingale”) from a different musical entirely, causing the setting of the play to temporarily shift to an oriental palace, and all of the actors to assume new roles. Man in Chair hurriedly corrects his mistake and The Drowsy Chaperone resumes. The show is abruptly cut short by a power failure in Man in Chair’s apartment. As the Superintendent arrives to attend to the breakers, the Man explains his love for the show as an antidote to “the dreary horrors of the real world.” The entire cast joins him onstage for the grand finale. Clay is playing the role of The Man in the Chair, a Broadway fanatic who is agoraphobic and a loner. He listens to the recording, hoping that it will cure his profound sadness. The Man in the Chair provides a running commentary throughout the show. At the end of the musical, the Man in the Chair is disappointed that the show is over. He begins to sing and is finally joined by the rest of the cast who cheer him and a sing with him. I am excited to see Clay in this challenging role. It will be interesting to see the character he creates as he plays the part. Will you be able to see Clay in this role? Will he be singing throughout or just at the end. Unless someone buys me a plane ticket I'm not going to be able to go, sniff. I hope Clay lets _Scarlett record the play for those that just can't go! I'm saving for the Gala in October! It sounds so interesting! Clay has a boat load of lines to memorize! It's nice that he's going "home" to perform with this company as this is where he got his first paycheck as an entertainer. I have not seen this musical but I will see it with Clay. Got my tickets. Sounds wonderful that Clay will be performing in this show, wish i could be there, it would be great if Scarlett could record this show. Thanks Musicfan xox. I had not heard of this play before this ,but I am looking forward to seeing it with Clay. I know he will do a great job. I am excited to see it! The show sounds wonderful. I know Clay will be wonderful in the leading role. It will give him a chance to display his superb acting skills, plus one song to display his beyond-belief singing skills. I have high hopes of going, but I have to adjust my schedule to do it. Working on it! Hoping I can visit my cousins in Raleigh so I can see Clay.GOOD LUCK CLAY! Everything you do is golden. I have seen this show. One of our local collages performed it a couple of years ago. It is a kind of madcap show reminiscent of old movies. I would love to see Clay in this role, but I don't think I can make the drive down to Raleigh this time. I think Clay will be great as "Man in the Chair". I've decided to go and see Clay, so yes, I will be seeing a couple of the shows…I am excited. How brave of Clay to take on something completely different. This certainly will be fun. I can't wait to see Clay in this role. It also seems like it is a great thing to add to his resume. Very excited about this one. The part was made for Clay. But, I just cannot make it this time. I know there will be many fans going…so, hoping for some clack. In the meantime I am watching the youtube's. He sure will have a lot to memorize…and The Man In The Chair is the main person in this play. Break a leg Clay!!!! Error: Error validating access token: Session has expired on Tuesday, 21-Aug-18 16:13:01 PDT. The current time is Friday, 26-Apr-19 02:15:36 PDT.